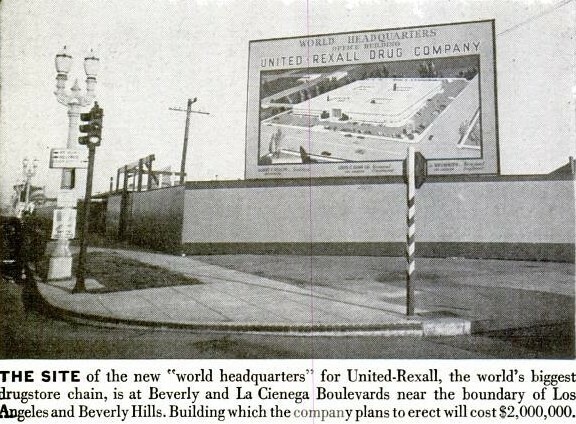 In September 1945, Rexall-United Drug Co., the largest in the world, announced that it was moving its headquarters from Boston to Los Angeles. 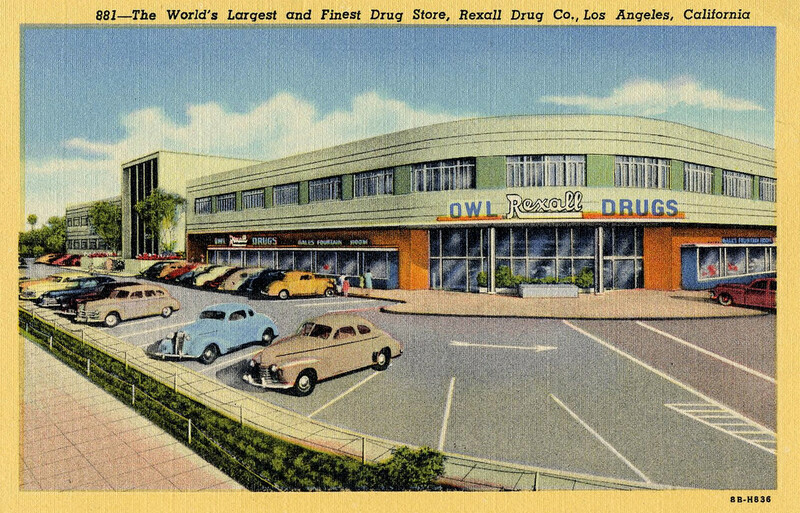 Rexall operated the Owl and Sontag chain of drugstores locally. An eastern company transferring its headquarters to the West Coast was a huge deal and was, local business leaders hoped, a sign of things to come. The impetus for the move was its new, youngish president, Justin W. Dart. He liked the climate in Southern California better. 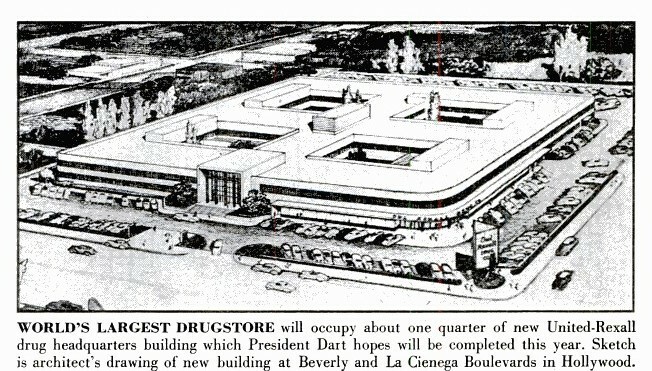 Located at the intersection of Beverly and La Cienega boulevards, construction of the gargantuan property necessitated removal of the landmark oil well in the middle of La Cienega near Beverly. Even with Dart’s drive and Rexall’s resources, it took time to get the needed materials for such a venture in 1946. 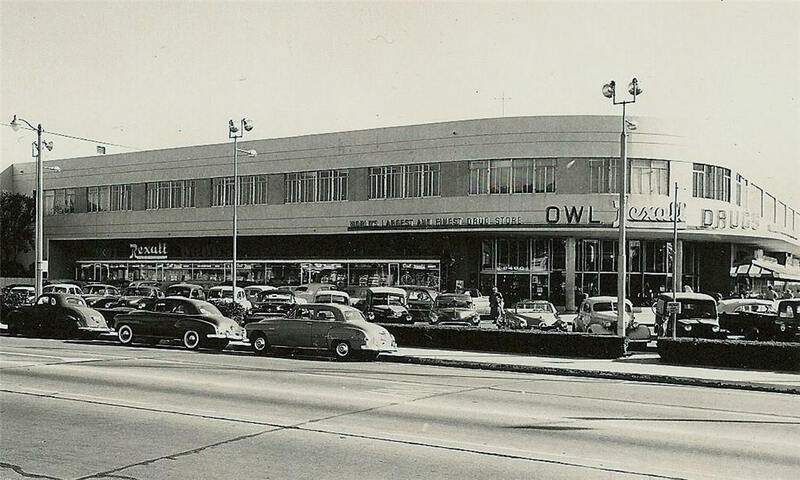 The World’s largest (and finest) Owl super drugstore, a cornerstone of the headquarters building, opened with a 4-day gala on September 15, 1947 as part of the United-Rexall world headquarters facility. It featured a fabulous liquor room “Like stepping into a wine cellar in a chateau in France,” a circular glass “Beauty Bowl” cosmetics counter, an enormous fountain-grill restaurant and parking for 300 cars. 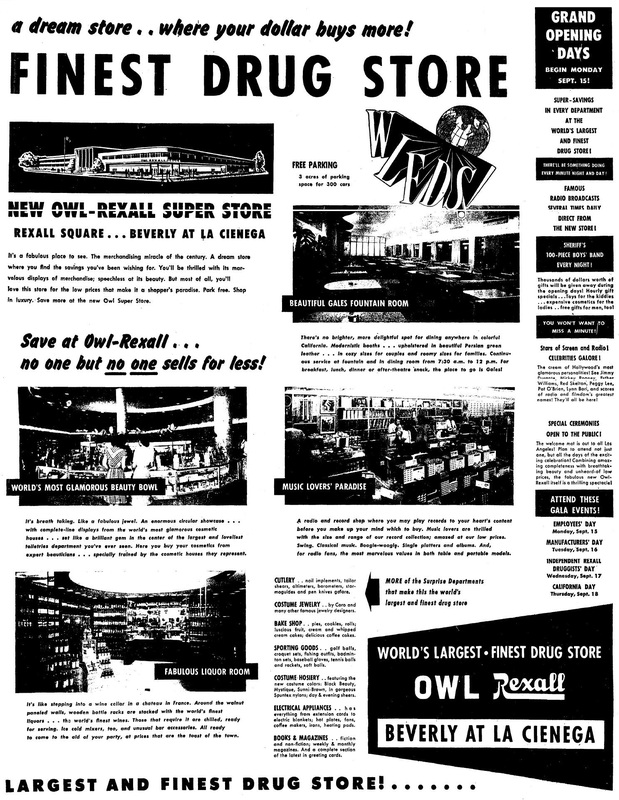 Ad for the Owl Rexall drugstore gala opening starting 9-15-1947. View of the completed United-Rexall HQ with the flagship Owl Rexall on the corner. 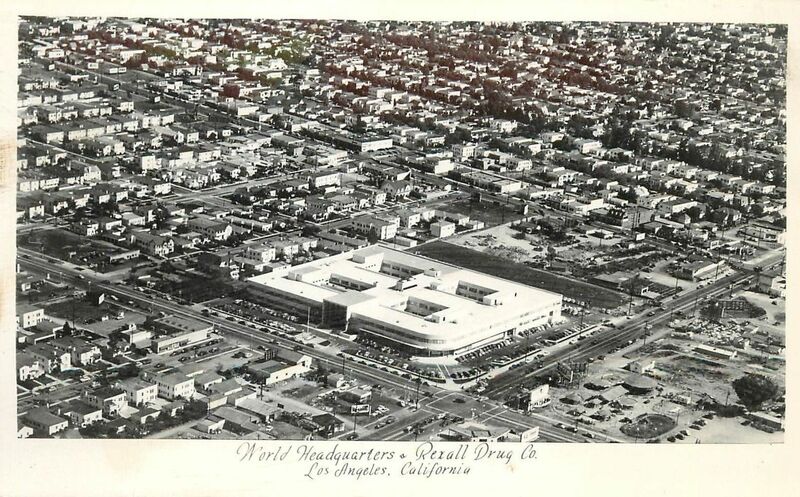 The United-Rexall headquarters and world’s largest (and finest) Owl drugstore and vicinity. Kiddie Land, with Pony rides, can be seen across the street. 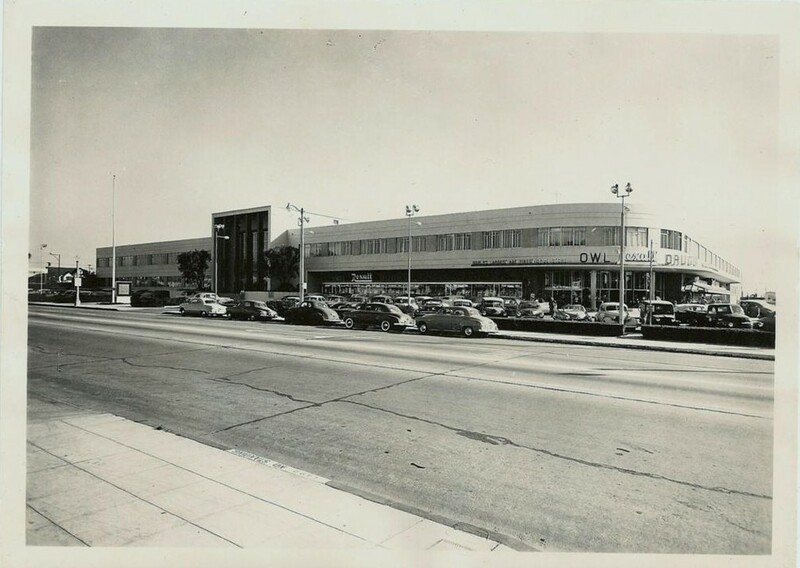 The huge La Cienega & Beverly Owl-Rexall. 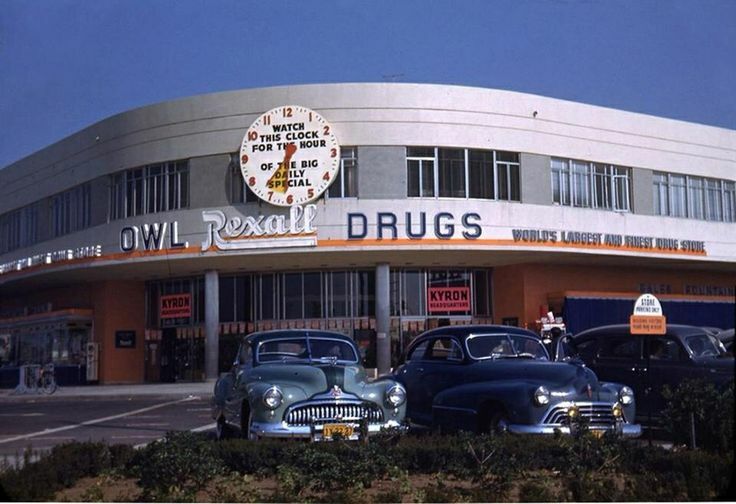 Color view of the La Cienega & Beverly Owl-Rexall in the 1950s.